Typically alumina plants refine bauxite to produce the aluminium oxide used in the production of aluminium metal. In the first stage of the process bauxite slurry is pumped into a large pressure vessel called a Digester, where it is mixed with a hot solution of caustic soda and steam, and reacted at temperatures in excess of 250oC. Due to the corrosive nature of the hot caustic soda, Gloucestershire-based weld overlay cladding and fabrication experts Arc Energy Resources provides specialised services to protect critical items of equipment such as steel pipes and valves, by applying a weld overlay coating of nickel to protect the steel from corrosion. The electro-plating often used to protect the equipment has a limited life and also suffers from pitting, which is both difficult to detect and manage, and can cause localised breakdowns and leaks. Arc Energy’s weld overlay cladding provides greater thickness and a more robust nickel coating; which is much more durable and cost-effective in the longer term. As well as corrosion, plants also have areas that suffer erosion, and Arc Energy is often called upon to carry out repair work using Hastelloy ‘C’. The Arc Energy workforce employs many people including managing director Alan Robinson who is a UK registered European Welding Engineer. The company is ASME certified and has extensive knowledge of welding engineering solutions. Its teams of welders are qualified to a wide range of procedures, and undertake specialised on-site repair work when required. Most of the equipment in alumina plants is traditionally manufactured in carbon steel but more exotic nickel-based alloys are needed in harsher environments such as the digestion area and the evaporation area, where a combination of heating and evaporation is used to concentrate the liquor and crystallise impurities. A heat exchanger expansion bellow, that is Arc Energy’s most recent example of on-site repair work, is fitted to an eight-foot diameter heater, one of two live steam heaters in a run of seven mounted horizontally on an elevated process area one storey up. The location meant that all equipment and materials had to be lifted into position. The work area also needed to be scaffolded and clad with plastic sheeting to protect the welders from the elements for the duration of the repair. The outer shell of the heat exchangers expand and contract due to the high operating temperatures, so bellows are fitted to compensate for the movement and protect the internal tubes from distortion. One of the two sets of bellows, which have been operating for around 30 years, was suffering from pin-hole leaks caused by cracking at the point where the stainless steel bellows is welded to the carbon steel vessel. As steam was escaping, the heat exchanger was shut down and the standby unit brought into service. 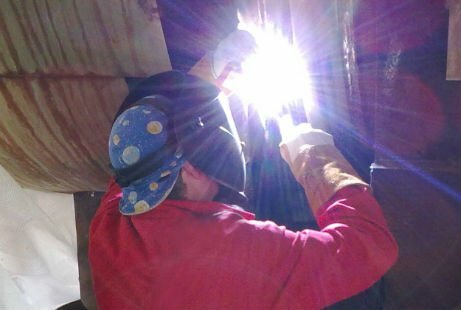 At the time, there was a three week window of opportunity to repair the bellows, and as the customer’s own welders weren’t qualified to undertake the repair nor were there suitable qualified welding procedures, Arc Energy Resources was contacted. Within days, a two-man team was despatched – both highly skilled welders and one acting as site supervisor – equipped with all the necessary equipment and materials. The bellows were heavily encased in sixteen 25mm thick carbon steel retaining straps that were installed when the heat exchangers were built, to prevent the bellows from flexing during transport. To gain access to the vessel these had to be cut and removed together with some of the side plates of the supporting structure. This left very little space underneath the vessel to excavate the old weld and reinstate it with new. The new weld was created using a two-pass procedure with 309L alloy designed to weld stainless steel base metal to carbon steel, and ensure a leak-free joint. On completion, the bellows were hydro tested to a pressure of 13 bar and the welds passed first time. The job was completed half a day earlier than the one week expected and well within the customer’s three week window of opportunity. The heat exchanger is now operational again. Quoting examples he says that Arc Energy has made items such as an injection heater and tee-piece and, after the customer had experienced such poor performance from replacement electroplated spools, Arc Energy worked with them to make the weld overlay spools more affordable. Since then the customer has purchased only Arc Energy spools, including replacing a complete line of electroplated spools with weld overlay spools. For other projects Arc Energy’s welders have refurbished heavy-duty 24” cast steel valves, cladding them with a protective nickel coating; and converted plain steel valves into nickel clad valves, which has proved to be very cost-effective compared to buying new nickel clad valves. Another contract has involved the manufacture of an injection heater that would normally have been electro-plated but, as it was destined for a particularly arduous duty, weld overlay cladding was applied instead. He adds that to date there are no signs of corrosion or erosion with Arc Energy’s weld overlay cladding since initial coatings were applied for one customer almost ten years ago, and he estimates that service life could be up to 40 years. Arc Energy works very closely in the early stages of a relationship to ensure that services meet the customer’s needs and are cost effective. A dedicated Arc Energy project engineer is allocated to the site to understand specific issues such as angular alignment, pipe lengths and any other factors that are important to the customer.